We know you may already be excelling in PFCC in some areas of your organization. We will work closely with you to determine your requirements and develop flexible, customized solutions tailored to your organization’s unique needs to embed and sustain PFCC across your organization. How do we meet your individualized PFCC needs? An initial, free assessment in our 10 areas of PFCC is available. 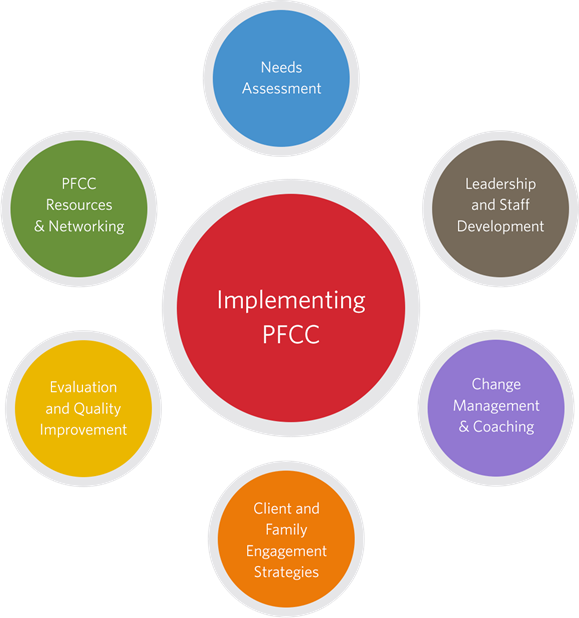 Our consultants can also provide an in-depth assessment of PFCC capacity and programming in your organization – what already exists, where there are opportunities for improvement, and what more needs to be done. We have developed a variety of evidence-based educational workshops and materials in different formats to meet all your educational needs. These are tailored to assist with embedding PFCC principles across your organization, change management, evaluation, and quality improvement planning. We are partnering with Accreditation Canada and will help you meet their standards. The guiding philosophy of PFCC is overarching – a culture shift across all levels of health care, organization-wide.